This .357 Magnum ammunition delivers inexpensive target shooting thanks to its economical steel-cased design. 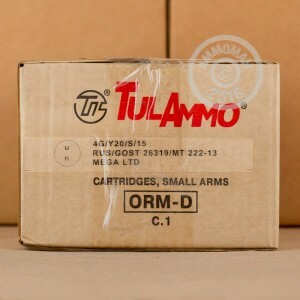 Manufactured by Tula, one of the largest Russian ammo producers, these cartridges fire a 158 grain bimetal jacketed bullet at 1,280 feet per second and deliver typical .357 Magnum ballistics and recoil. 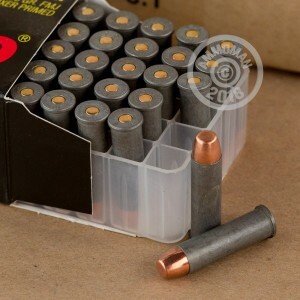 This ammo uses non-corrosive Berdan primers as well as non-reloadable steel cases. It has magnetic properties due to its steel components and may not be suitable for all indoor ranges. 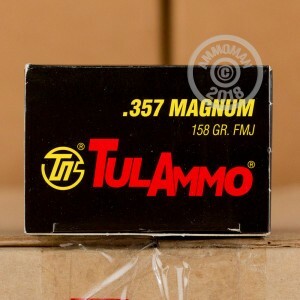 Pick up a few of these 50 round boxes or any other items totaling $99 or more to get free shipping from AmmoMan.com! Picked this up as an experiment. Got through two cylinders in a Ruger GP100. Ammo was accurate, a little under-powered compared to some others, went bang with each pull of the trigger, but would not release from the cylinder without the assistance of some deadblow taps on the ejector. By way of troubleshoot, case diameter in the middle measured after shooting was a skoshi (technical term?) larger than its brass counterpart. maybe the steel is less elastic (though Brinnell and Rockwell is comparable to brass) and doesn't snap back as readily. As titled, if there is a revolver (or carbine) that can use this ammo without issue, it will be a fantastic get for training or trade. Will be coming back to order some brass cased .357 for training. Never had fired casings get stuck before but these bullets expanded and did. I had to hammer them out to remove.